People everywhere were glued to their radios or TV sets or computers—listening to, watching for, and reading about the unfolding devastation following Hurricane Katrina. The unimaginable horrors drove many to question: what can I do to help? Two members of the Center for Neighborhood Technology’s (CNT) Wireless Community Network (WCN) project team led one effort out of Chicago. Paul Smith, WCN Technology Director, and Rogers Wilson III, Network Technician for the North Lawndale WCN, realized that their experience building, deploying, and maintaining CNT’s demonstration wireless community networks could be transferred to the Gulf region to connect evacuees and first responders with communication tools—computers, Internet connectivity, Voice over Internet Protocol (VoIP) phones, and technical assistance. After coordinated planning with other community wireless groups and the Wireless Internet Service Providers (WISP) group convened by an FCC-sanctioned affiliate, Paul and Rogers packed up a van, donated by CNT staffers Karen Hobbs and Peter Haas, with wireless cards, repeater nodes, antennas, laptops, tools and more. The WCN Team arrived in northern Louisiana at Mac Dearman’s farm the evening of September 6th. They were met by the Dearman family, who were generously sharing their home, food, and the broadband Internet services they provide. 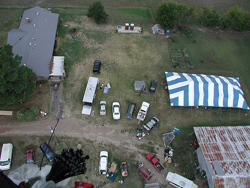 Together with other volunteers from across the country, hardware vendors, and supporters such as the Disaster Relief Network, the group made a dozen wireless links from Mac’s 100 foot tower on the farm to area shelters. Fifty to one hundred-fifty people were staying at each of the shelters now connected with Internet and hardware. With the help of volunteers at the shelters, evacuees were able to look for relatives and friends, register and process the necessary paperwork with the Federal Emergency Management Administration (FEMA) to receive relief assistance, and talk on the phone to people for the first time in over a week. Phone lines were damaged and broadband scarce, so wireless systems provided a low-cost and mobile solution to multiple challenges. 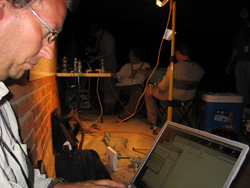 The expertise garnered in work with wireless community networks in low income communities in Illinois—Pilsen and North Lawndale in the City of Chicago, Northeast neighborhood in Elgin, and West Frankfort—served Paul and Rogers well as they assisted with the connection of shelters and the training of people residing there. Paul’s project went on to Bay St. Louis, Mississippi at the end of the first week. He again worked alongside volunteers from the community wireless arena, low-powered radio field, WISPs, and housing associations from all over North America. 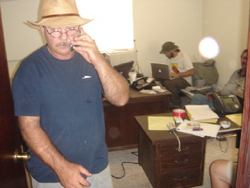 Paul and the volunteers faced challenging circumstances, i.e., no power, no potable water, to provide Internet and phone service to relief teams and area residents in Bay St. Louis. The team of volunteers is continuing to grow, as some new volunteers replace others who need to go home for a spell. The great need is for communications resources, training, and support—and the work continues and will continue. Updates are available through Radio Response, the group of IT professionals founded by Mac Dearman, and CNT's Wireless Community Network Project. Nicole Friedman is Wireless Community Network Project Manager for the Center for Neighborhood Technology.